My mom never really enjoyed cooking. Her work was exhausting and would often keep her late, so by the time she got home the last thing she envisioned herself doing was spending an hour making supper. But she did it anyway, for our sake. She often made casseroles; simple things that would feed her family and leave enough leftovers for tomorrow’s lunch. 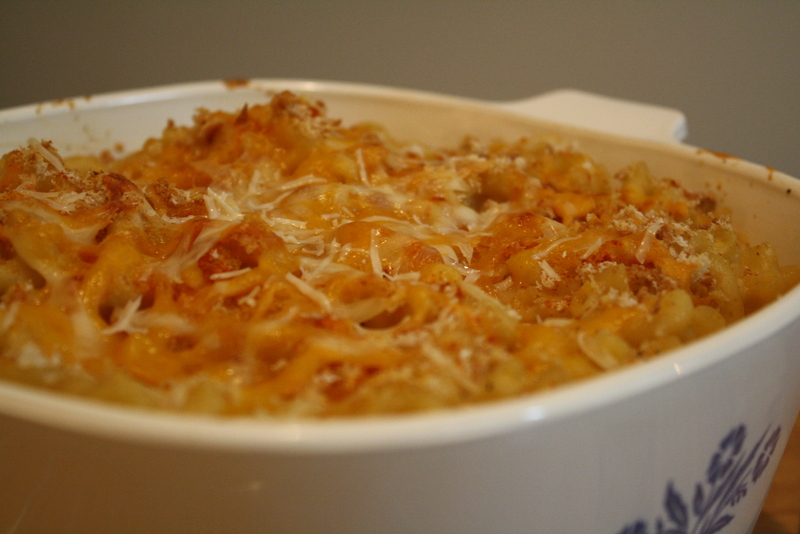 A more popular dish was her homemade macaroni and cheese. Rich with cheese and just the right amount of gooeyness, this meal is the perfect solution to the Monday blues. I’ve altered her original recipe to include chunks of mozzarella cheese: when they melt, it’s pure heaven. I also like to break apart half a heel of bread to make bread crumbs for the crust. Cook macaroni in a large saucepan according to package until al dente. Drain with colander. Rinse cooked macaroni under lukewarm running water and repeat every five minutes until ready to use, so the noodles don’t dry and form a clump. Preheat oven to 350 degrees Fahrenheit. Butter the two quart casserole dish. Melt butter in medium saucepan on low heat, stirring constantly. Once butter is completely melted, slowly add flour. Whisk with a fork or whisk until flour and butter form a smooth creamy mixture. Gradually add milk, whisking in between additions. Bring to a boil, then reduce heat and stir until sauce thickens. Shred cheddar cheese and add to mixture, stirring until cheese melts. Add dry mustard, salt and pepper and whisk briskly until combined. 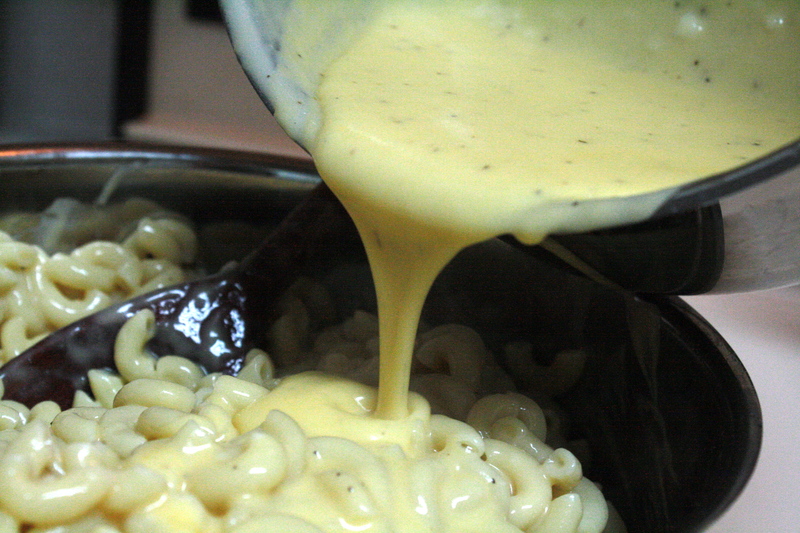 Rinse macaroni again, then combine with cheese sauce. Dice mozzarella into cubes and add to macaroni. Turn into buttered casserole dish. Top with bread crumbs, paprika, shredded cheddar and mozzarella cheese and parmesan cheese. Bake for 30 minutes. Mmh! I can’t wait to try this recipe! Thanks for accepting the challenge! I quite vividly remember the days of “Hot Mama Surprise!” You really have a flare for storytelling. I look forward to reading more stories about our younger years and the family. So proud of you–keep the recipes coming! Trying the recipe right now. It looks good! Ha! I just noticed your reply to Andrew’s comment. How very true it is…. He doubled it, so there was plenty enough to satisfy even me. It turned out really well, Gil, despite some setbacks on the part of the chef, which declares this recipe foolproof! I made this one too – super good : ) I like the idea of putting the blocks of mozza in it… yum. Also makes great leftovers.